In 12-inch nonstick skillet, heat 2 tablespoons of the oil over medium-high heat. Add frozen hash brown potatoes in even layer; press down lightly. Cook potatoes 7 minutes without moving. Drizzle with remaining 1 tablespoon oil; turn. Cook 6 to 8 minutes longer or until browned on both sides and hot throughout. Transfer to medium bowl; cover with foil to keep warm. Wipe out skillet. In large bowl, beat eggs, green chiles, salt and pepper until well blended. 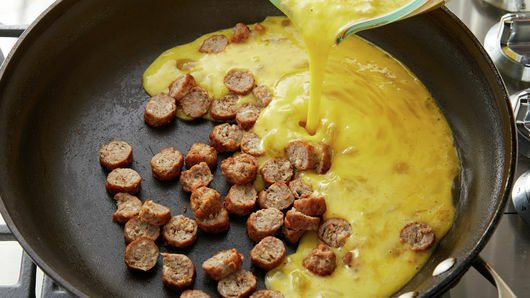 In same skillet over medium-high heat, cook sausage 2 to 3 minutes, stirring frequently, until browned. Stir in egg mixture; cook 2 to 3 minutes, stirring occasionally, until scrambled. 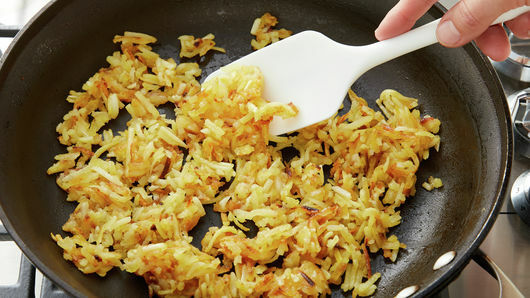 To assemble burritos, spoon line of hash browns down center of each tortilla. Top with cheese and egg mixture. 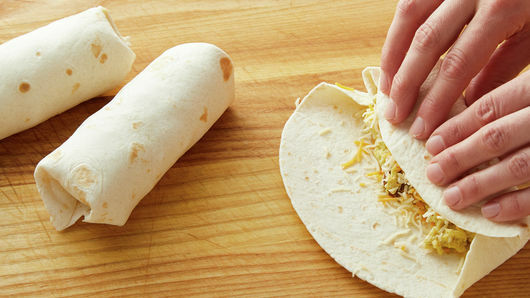 Roll up each tortilla tightly to secure filling. Serve immediately, or freeze as directed below. 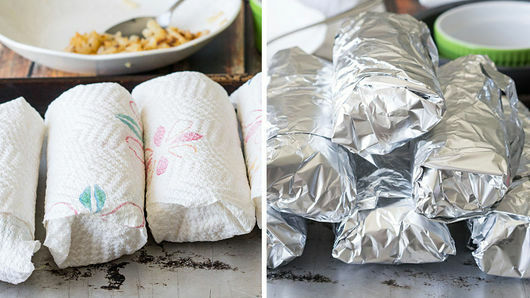 To freeze, wrap each burrito in foil. Label 1-gallon resealable freezer plastic bag. Transfer burritos in single layer to bag; remove as much air as possible, and freeze up to 1 month. To heat: Remove 1 burrito from foil, and wrap in lightly dampened paper towel. Place on microwavable plate; microwave uncovered on High 2 minutes 30 seconds to 4 minutes 30 seconds, turning once, until heated through (at least 165°F). Though the burrito is thought to have been first made in Mexico, the breakfast burrito is an American invention, first regionally popular in states like Texas, California and New Mexico, but now well known across the United States thanks to fast food and restaurant menus. 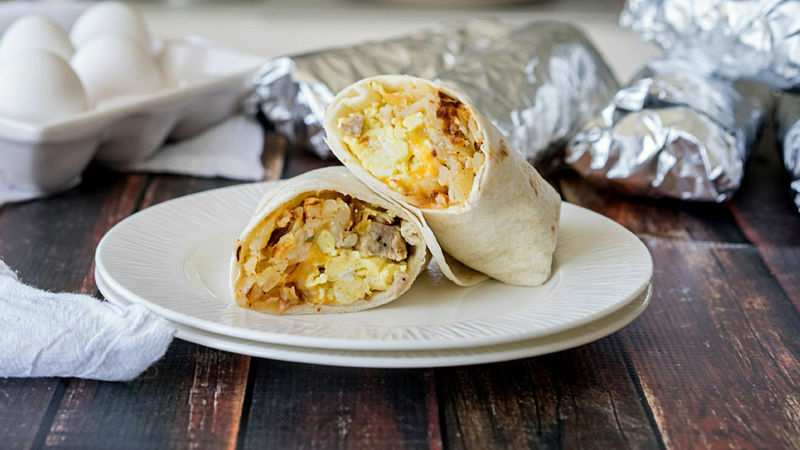 A breakfast burrito is traditionally filled with ingredients typical of an American breakfast like eggs, hash browns and sausage or bacon to start, and it all gets wrapped in a flour tortilla. 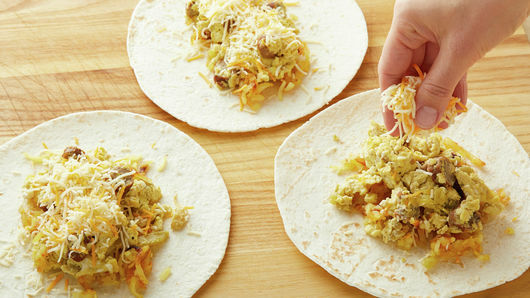 Thanks to this easy recipe, you can make a batch of breakfast burritos on Sunday and stash them in your freezer for a quick grab-and-go breakfast all week long. Want to eat burritos for dinner, too? We have plenty of burrito recipes for you to choose from. Make sure you give enchiladas, another popular Mexican dish, a try, too!